Back in April I wrote a post about a Triumph 2000. At the time I mentioned that the 2000 was never officially sold by Triumph in the US. Several readers sent me e-mails telling me that Triumph did in in fact send the car to the US, but in extremely limited numbers. This car is located about 15 miles from my house. For a New England car, it appears to be in good condition. It appears to be complete and the pictures show no serious rust. (I'm sure there is some - that's to be expected in any older car that has spent time in New England) Best of all, it's left hand drive. The seller gives little information in the ad, but leaves a phone number. Assuming the car is as complete as it appears to be, the asking price is not unreasonable. Spend a few days each month on this car and by this time next year you'll have a nice car to take to local car shows. 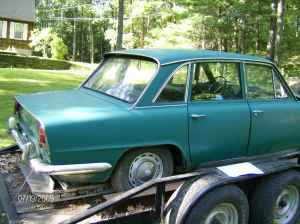 Located in Belchertown, MA, click here to see the Craigslist listing for this 1967 Triumph 2000. Click here to see my original Triumph 2000 post.